Vikings wide receiver Laquon Treadwell's competitive edge and work ethic stand out through the eyes of Vikings GM Rick Spielman and Head Coach Mike Zimmer. Following the selection Laquon Treadwell in the first round, General Manager Rick Spielman and Head Coach Mike Zimmer addressed the media. They commented on the competitive edge and tenacity of Treadwell's game and had no reservations about the selection. It is clear that Treadwell was the player they coveted with the 23rd selection. Even with an enticing product like UCLA linebacker Myles Jack on the board, the Vikings elected to draft Treadwell with the 23rd pick. Mike Zimmer started his press conference by joking about adding defensive talent. Zimmer joked, "You all thought we were going defense didn't you?" It is evident the Vikings had a plan to add offensive talent to upgrade their passing attack that ranked 31st in the league in 2015. It's clear based upon the amount of scouting the team did when the evaluated Treadwell. GM Rick Spielman discussed how much evaluation they had done when analyzing Treadwell over the last few months. "Spent a lot of time with him throughout the process," Spielman said. Spielman attended his pro-day at Ole Miss and came away impressed with both his attributes on and off-the-field. "We thought very highly of Treadwell not only on the field, but what he represents off of it," Spielman said. Both Mike Zimmer and Rick Spielman echoed the amount of growth Treadwell showed after suffering a broken fibula in 2014. Spielman discussed his slow start to 2015, but as he became more comfortable following the injury, he felt the final portion of his 2015 season was a success. 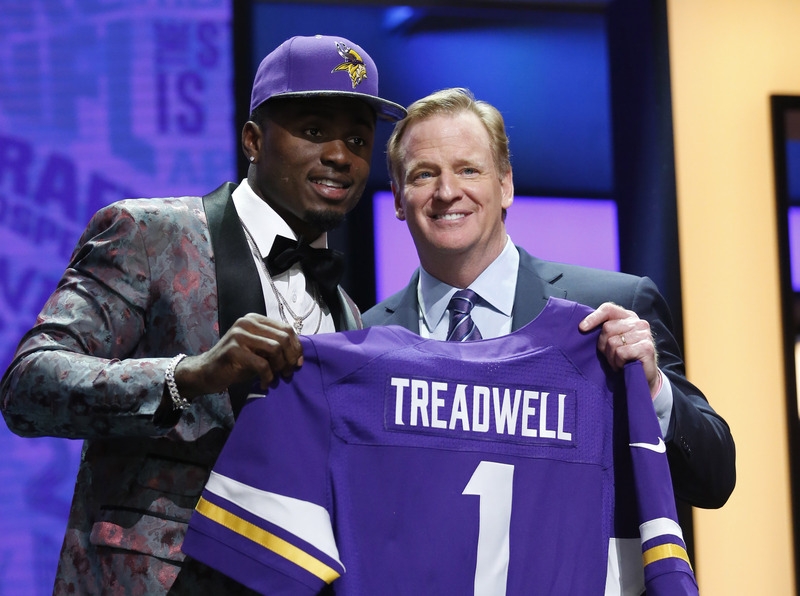 In 2015, Treadwell hauled in 82 receptions for 1,153 yards and 11 touchdowns. His 11 touchdown catches were tied for 11th-most in the nation. Those numbers caught the attention of scouts and coaches across the league. Particularly, head coach Mike Zimmer discussed the play-making ability Treadwell can provide in not only the red zone, but throughout the field of play. He wants Treadwell to be a player that can change games all over the field. “I don’t want this guy to be just a red zone receiver. I want him to be all over the field,” Zimmer explained. The biggest attribute of Laquon Treadwell's game that was discussed by Rick Spielman and Mike Zimmer was his run blocking. Zimmer and Spielman both called him one of the best run blocking wide receivers they have seen on tape. "[Treadwell is] maybe the best run blocker I've seen in years coming out," Spielman added. Zimmer went even further, calling Laquon Treadwell one of the best blocking wide receivers he has ever seen. "He is the best blocking wide receiver I've ever seen," Zimmer stated. That is a huge statement coming from Mike Zimmer who has coached a countless number of players for over 20 years in the NFL. Zimmer also continually discussed how Treadwell's competitive edge and natural skills are areas that specifically stand out in his game. Laquon Treadwell is a player that Zimmer feels is a perfect fit within the brand of football he is developing in Minnesota. "This kid is a lot like I'm trying to build this football team," Zimmer said. When asked about the attributes that stood out in Treadwell's game, Zimmer had many positive remarks for the 6'3" wide receiver out of Ole Miss. "He has a huge catch radius. He works extremely hard. He's all about football. He's a leader," Zimmer explained. Early in the draft process the Vikings knew they needed to add a big-bodied threat to their wide receiver corps. Zimmer stressed the importance of drafting a wide receiver that could haul in contested catches. "We felt like we needed a big receiver that could go up and get the ball," Zimmer stated. Treadwell is well-known for his ability to make tough contested catch in traffic. Not to mention, he has very reliable hands and can make tough plays with cornerbacks draped all over his back. Many draft analysts were concerned about the 4.63 40-yard dash time Treadwell ran in his workout. However, Spielman feels he plays much faster on tape than his workout numbers indicate. "We try to make estimates on what we see with speed on tape," Spielman added. Spielman did note Minnesota had about four calls from other teams about moving up to the 23rd selection. However, he said the Vikings didn't have any interest. "Value would have to be rich to pass up a player like Treadwell," Spielman concluded. The Vikings added a playmaker to their wide receiver corps that can provide them with a threat in a variety of areas across the field. Not only the red zone, but across the middle of the field too. His competitive edge and passion for the game stand out in the eyes of GM Rick Spielman and head coach Mike Zimmer. If he can continue to grow as a player, he could be the game-changing playmaker the Vikings were searching for on their roster.